Last Friday was totally devoted to Science and the school was a bustling hive of activity as children worked in small groups of mixed ages on a number of science-based projects supported by staff, governors and volunteers. Groups worked outside investigating and creating animal homes; inside they used their craft skills to make paper rockets; created “fuel” so they could launch fizzy rockets from the launchpad in the school field and learned how to make slime. They also entered a poster competition. However the most fascinating was when each group entered the Planetarium Dome kindly provided by Marches School. In the dome they looked up into the heavens, saw the changes in the sky from dawn to dusk and how the moon and stars move across the night sky. They then travelled out through our solar system, and every planet was visited by at least one of the groups. One of the many facts they collected on their “journeys” being that it rains diamonds on Jupiter! Finally the groups looked at various nebulae before they “powered up their rocket” and headed back to earth. 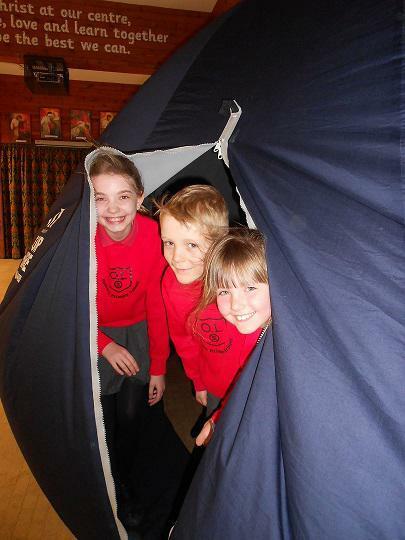 Our photograph shows Molly, Jac and Alys emerging from the planetarium and their space trip.